Taking a look at this week's College Football Playoff Rankings, which are good news for Alabama, and very unfair to UCF. The only ranking that mattered this week from the committee was Alabama’s. Okay, that’s a slight exaggeration, but not by much. Six teams control their Playoff destiny right now: Clemson and Miami (the winner is in), Auburn and Georgia (winner is in), Oklahoma, and Wisconsin. 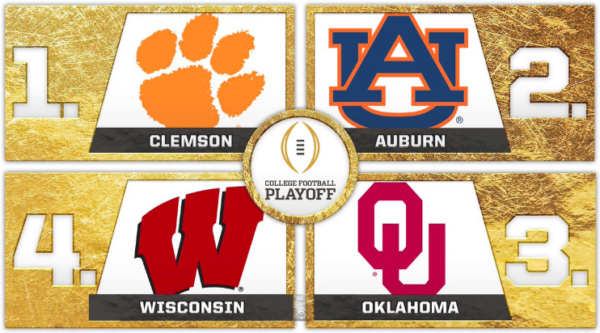 If Oklahoma and Wisconsin win this weekend, picking the four Playoff teams will be an easy decision. Oklahoma is favored; Wisconsin is not. The committee knew coming into these rankings that the biggest debate would be between Ohio State and Alabama. The voters had to take that into account. Where the committee put Alabama this week would show how far they think the Crimson Tide are ahead of the Buckeyes. Well, Alabama was not in the Top 4 or ahead of Wisconsin, both of which would have been killer for Ohio State. Alabama came in at No. 5, which is about the highest anyone expected Alabama could be ranked. There are good arguments for putting Alabama behind Georgia — the Bulldogs have several wins over good teams that Alabama doesn’t have — but the committee didn’t agree with them. Alabama at No. 5 is bad news for Ohio State, but it’s not the end for the Buckeyes. Hocutt did, however, address the gap between Ohio State and Alabama in his conference call. As expected, he didn’t say anything definitive, but what he did say should encourage Buckeyes fans, at least a little. Kirby Hocutt said teams 5-8 are close. Said Ohio State's loss to Iowa "It's a factor." It's something the committee talks about whenever they talk about Ohio State. Hocutt made it clear that Ohio State has a big opportunity in the Big Ten title game but wouldn't go much further than that. Reiterated importance of CCG when comparing similar teams. There were no real surprises in the rankings, though there are a few strange choices. We’ll get to those later, but let’s talk about UCF first. The committee has, consistently, been far less kind to UCF than any of the human polls, computer rankings, or advanced metrics computers. The Golden Knights picked up their second-best win of the season, and three teams ahead of them lost. UCF only moved up one spot, as Stanford and Washington both jumped the Knights. The committee hasn’t really had a chance to be unfair to a Group of 5 team in the past, but they are absolutely abusing the opportunity this season. There are good arguments as to where UCF should be, but No. 14 is clearly too low. An important note right behind UCF in the rankings, though, is that Michigan State stayed ahead of LSU. Assuming that stays the same next week (and there’s no reason it shouldn’t), that’s good news for Ohio State. It means that, with a win over Wisconsin, the Buckeyes would have three wins better than Alabama’s best win. Will that be enough to overcome the lopsided loss to Iowa? Maybe, but the committee is certainly hoping we don’t have to find out. The strange decision comes at the bottom of the rankings. Fresno State snuck into the rankings at No. 25. In abstract, that’s not an odd ranking. The Bulldogs have two fine losses (to Alabama and Washington), though the third one against UNLV is a little troubling. Fresno State also has two decent wins, over San Diego State and Boise State. Putting Fresno State in at No. 25 is understandable, if not the best choice. However, ranking Fresno State makes zero sense when you consider how the committee has treated UCF. UCF, each of the past two weeks, has been behind Power 5 teams with three more losses than it. There are plenty of Power 5 teams with one or two more losses than Fresno State that have far better wins (Iowa State immediately comes to mind, but Louisville and South Carolina also have much stronger resumes). How does the same committee mistreat UCF so badly while giving Fresno State — a team with a worse SOS than UCF — so much benefit of the doubt? Going back to 2014, we can note a slight pattern. Teams at the back end of the rankings often are able to bolster the resumes of teams in tough positions at the top. Minnesota (who played Ohio State) in 2014 is the most prominent example, but these have almost always been defensible choices for the committee. Fresno State — who played Alabama back in September — raises eyebrows, though it will be a moot point if Boise State wins the MWC Championship Game.